We have forwarded you to Amazon. Click “Our Verdict” to see our rating again. You’re smart to be thinking about the DeWalt DCD791D2. 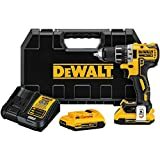 DeWalt as a company has a big reputation in the world of power tools as a whole, and perhaps particularly within the realm of drills. Undoubtedly, this reputation is mostly because they make quality products like this one. The purpose of today’s review is to take a deep dive look at the DCD791D2, but there is some basic information that we can go over now that should help you understand what you are dealing with a little bit better. To start, this is definitely a higher end tool. DeWalt, in general, is known for making pricier, but generally higher quality tools, but this unit is a little bit pricey, even for them. But, if you are willing to pay for it, there is a lot to like. The tool is lightweight, compact, and it features a great brushless motor that seems poised to stand the test of time. But like we said, if you want something that is a little bit less expensive, you are going to want to think about getting something else. Preliminary thoughts? It’s a great tool for people that want quality and are willing to pay for it. If you want more, you are going to need to read on as we now dive into our DeWalt DCD791D2 review! The lighter the weight, the better, right? This tool weighs in at around seven pounds (including the weight of the battery pack), which actually is not the absolute lightest option that you will find. While there are daintier tools out there, the bottom line is that seven pounds should nevertheless still be light enough to keep you comfortable as you work. If you are looking for the absolute lightest tool that you can get your hands on, this isn’t it, but it should do well to ensure that you don’t get too fatigued after a long day of using it. The design of the tool is also really compact, which means that it is going to be great for accessing tight corners and awkward angles. Even if you expect that you are only going to be using the drill in typical spaces, the compact build will still be nice to have. Better to have it and not need it than to need it and not have it, right? LED lights are a popular new feature among high-end tools of just about every variety. The idea is that the lights help illuminate your workspace to produce the cleanest and most accurate work possible. Some people are really into this feature while others are fairly indifferent towards it but regardless it’s another one of those things that is nice to have. The LED light system that is featured here is actually a little bit more advanced than the ones that we have seen on other tools. DeWalt installed these lights with three different built-in settings (including a “spotlight” setting designed to really focus on the drilling area) so that you can customize your use of the feature to suit your specific project needs. The motor is always going to be the most critical component of any power tool, and fortunately, the DCD791D2 comes equipped with a really great one. To start, it is brushless, which is more or less what shoppers have come to expect from drill produced within the last few years, but it is still nice to see here. The brushless motor is lower maintenance than brushed alternatives and it also just tends to last a lot longer. It’s also just a really powerful drill, with a maximum no-load rotation per minute output of 2000. With that sort of power, you should not have much trouble handling both big and small jobs. Finally, it also features two different speed settings that are going to allow you to take a really customized approach that will suit the needs of any job. For more delicate tasks, you can use the milder setting that goes from 0-550 RPM. On the other hand, if you find yourself in a situation where you need to use the tools full power potential, you can change the setting and access higher speeds that go from 0-2000 rotations per minute. What does no load speed mean? No load speed refers to how fast the drill is able to spin when it is not interacting with a material. While measuring speed in this fashion may sound deceptive, it is the only way to give an accurate read of a tool’s speed without attempting to account for an impossible number of variables. What kind of warranty does this tool feature? The warranty is more or less what you would expect to get from a major tool company. There is a 30-day money back guarantee, 1-year of free maintenance, and a 3-year limited warranty. Does this tool come with the bits? Unfortunately, no bits are included and will need to be purchased separately. People that own this tool seem to really enjoy it. People love the lightweight design, the extremely smooth operation of the motor, and the tremendous power that the drill is able to pack. We have even heard from some people who are using this tool to work through concrete (please do note that this is not the intended use of the tool, and therefore not a recommended activity). We did hear from a couple of users that they have had some issues with tightening the chuck. Most impressions of the tool are extremely positive. So, what are you thinking? It sounds pretty great, right? It comes with an excellent motor, a compacted lightweight design that should give you easy access to most jobs, and a few extra features, like LED lights, that make it a breeze to use. If you are willing to fork over a few extra dollars, this seems like a tool that users with a moderate budget are really going to appreciate.